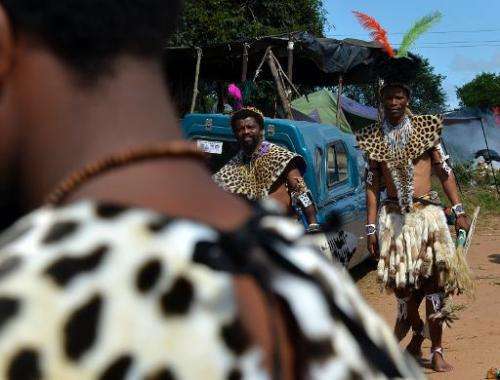 Carrying Zulu warrior shields and draped in leopard skins, the men of South Africa's Shembe Church move hypnotically as they go through the steps of a traditional religious ritual. But the striking spotted pelts around the dancers' chests are slowly being swapped for synthetic faux fur—thanks to a pact between conservationists and church leaders. 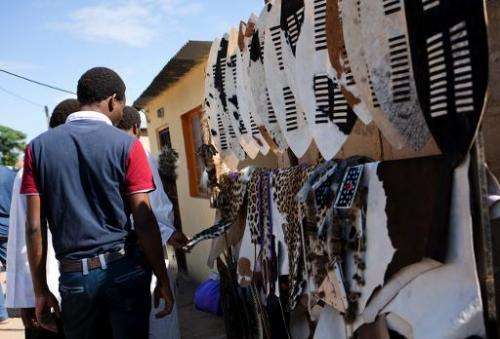 Leopard skins are a symbol of pride and royalty in the Shembe religion, which was founded a century ago in the country's eastern KwaZulu-Natal region with roots in Christianity and Zulu customs. However, with the big cat populations threatened by loss of habitat and poaching, Shembe leaders have backed a cheaper and predator-friendly alternative that still upholds tradition. "The leopard skin has got a significance because it shows power," said Lizwi Ncwane, spokesman for the church officially known as the Nazareth Baptist Church. "For the past four months now, we have been using fake skins because we are trying to bring awareness among our people," he told AFP. Boasting more than five million members, tens of thousands of faithful flock to a special service every January where older men move to the rhythmic sound of drumbeats and low trumpets. "That is the way we worship God, we worship through prayers as well as dances," said Ncwane. 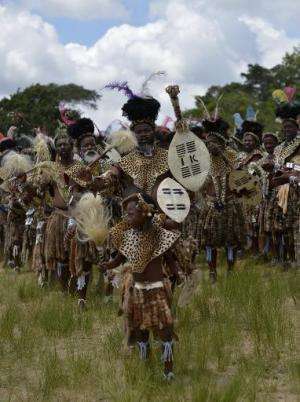 But participants must wear the colourful ceremonial dress, which includes a loin cloth of monkey tails, a leopard skin belt, elaborate headgear with ostrich feathers and above all a cape of leopard skin slung across their naked chests. "It represents being the king," explained mineworker Sphiwe Cele, who says he paid 4,500 rand ($412) for his legally-hunted authentic leopard skin—a fortune for the average South African. 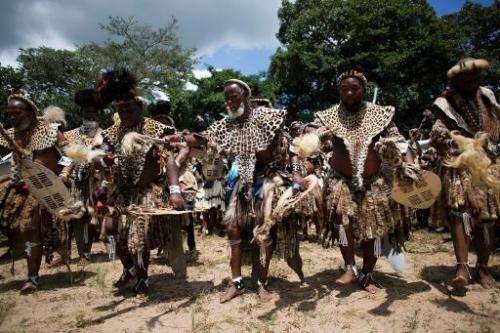 "Of course we are not the king of the Zulu, but Shembe said we are the kings of our homes, so we must wear this today when we go to the traditional gathering," he added. In a country where leopard hunting permits are only affordable for the very rich or foreign tourists, conservation groups dispute that the trophies worn at Shembe gatherings are legal. "This is the biggest display of illegal wildlife contraband on earth," said Guy Balme, Africa leopard programme director with US-based conservation group Panthera. "Everything you see here is totally illegal," he said at one of the dances as music rang out in the background. Most of the skins come from poachers in South Africa and neighbouring Mozambique, Zimbabwe and nearby Malawi, he said. Listed as "near threatened" by the IUCN Red List of Threatened Species, leopards number between 5,000 and 7,000 in South Africa today, according to conservation group Landmarks Foundation director Bool Smuts. "They certainly are on a distinct decline," he said, cautioning that no official figures exist. To stem poaching, Panthera in recent years has worked to develop authentic-looking fake leopard skins and to convince the Shembe to use them. Some less well-off dancers were already wearing a form of fake fur with cow and impala skins painted with leopard spots, said leopard programme coordinator Tristan Dickerson. "So I thought, 'well if I came up with a realistic version, maybe we can introduce it to the church'," said Dickerson. The fabric is produced in China, then shipped to Durban where it is sewn into the final product. "It has taken four years to get to the point where we are now, where they are accepting the furs and they are using them," said Dickerson. Panthera aims to distribute 6,000 mantles by mid-2014—free for now—and has already given out a third of that. About 10 percent of members' furs are now estimated to be fake, since the church threw its weight behind the initiative. Donning his own synthetic leopard fur, spokesman Ncwane suggests that up to 70 percent of dancers will have given up real skins within two years. Later, loin cloths, bracelets and belts will follow, costing much less than the full natural fur regalia which costs up to 15,000 rand. "It has become a kind of a trend," said Panthera volunteer John Smith. "At the beginning, some were very rude and told me they didn't need those needless blankets. It was then endorsed by the church."